This is the time of change. A new school year begins and with that for some of us, new routines, new locations, family transitions, and new adventures. For the families at CNS, the start of a new school year is often well anticipated – either because it is the beginning of some sort of formal school experience for a child, or the continuation of a child’s immersion in the land of creation, socialization, peer negotiation, and playground participation. Change. Shift. Beginning. For me personally this fall, what feels like a really big shift is going on. My oldest child has left for boarding school. 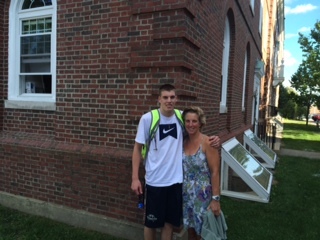 He will be doing a post-graduate year at Phillips Exeter Academy in New Hampshire. He graduated from Lexington High School in June. This decision came about for many good reasons – and can be thought of as a similar step to keeping your child at CNS for one extra year of preschool before sending them on to Kindergarten. “The days are long, but years are short.” I know if you are reading this and you currently have young children, you are most likely rolling your eyes right now. I think I got sick of it too when my four children were young. It didn’t really help me at all between diapering and lactating and washing and folding (never mind cooking, cleaning, nose-wiping, and tantrum-dealing) to somehow believe that time would actually begin to fly. It never felt that way. But it happened. I blinked. And now he’s gone. Yesterday, as we were saying our final goodbye, my tears began to flow and I almost lost my ability to speak. Something came out of my mouth similar, to “Take care of yourself”. And my beautiful boy, who is so very ready for this next phase of his life, gave me a huge hug, practically picked me up, and said, “Mom, I’ll be ok, as long as you are ok.”. Which of course only made my tears flow even more. Here was my 18 year old son helping me deal with this transition. I suppose life has already done what was needed to get him ready for his. And so as a parent, I continue to be humbled by my children – the independent, confident, and practically grown-up people that they have become, all while I was looking away or caught up in the moments of doing (because while the diapering and the lactating soon fade away, the driving and the cooking and the laundry never stop). As some of you enter this week of new beginnings, realize how ready your children are for a new adventure of their own. As Hugh hugged me and reminded me of our connection – and about how important it is for him to know that I’m going to all right – it reminded me of how so much of our children’s experience and reactions to new situations are drawn from the cues they receive from their parents. He was reminding me that he can be ok and brave and able – as long as he knows that I am also confident and sure of his new path. And so yesterday, I wiped up my tears, did my best to smile (you know that sort of crooked smile you try to form on your face when your eyes are still trying to cry. ), and hugged him back.